When the logged frequencies are monitored simultaneously on separate receivers or instances, it is observed hopping repetitively from one freq to the next higher frequency in sequence. Depending on which frequency or time interval is listened to, it sounds like either continuous dits, or groups of 3 dits. First was logged on 14350 kHz around 1940UTC, and then a closer look at it yielded other companion signals at around 2145UTC. Pattern on 14350 kHz. approximately 28 millisecond dit duration, 3 dits at 1.411 second repetition rate, 9.4 second pause. Note: noise level in 3 kHz bandwidth approximately -130 dBm. Signal ceased on all logged frequencies simultaneously at the top of the hour. Frequencies logged are noted to be in standard increments of kHz, and sequential hop activity is similar to the operational pattern of the Son of Yosemite Sam hopper from November 2018. 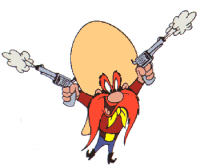 The 9 second cycle is similar to Son of Yosemite Sam. Wild guess: It is a low power frequency hopping antenna system being tested, probably located somewhere in southwestern USA.